If you’re looking to take your creativity to the next level you need to be on the lookout for the best drawing tablet for beginners. A great drawing tablet can really help you step up your design game, and keep your doodles digitally so you’ll never lose them to a spilled cup of coffee or a lost notebook ever again. 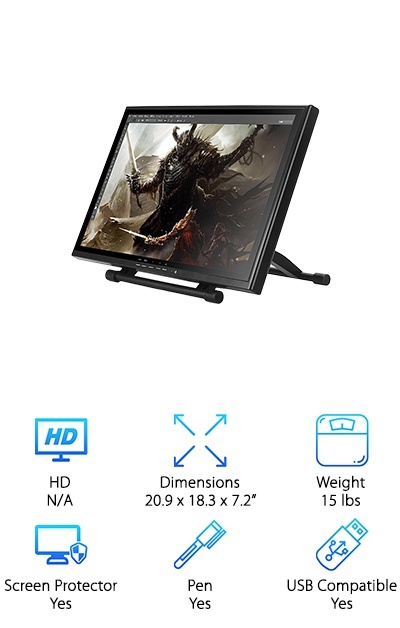 Be sure to look over a drawing tablet review or two before you buy this awesome piece of equipment. HD: This is a really important feature on drawing tablets with a screen that displays what you are drawing. If you’re just looking for a tablet to connect to a computer, don’t worry about this. Dimensions: How big is this thing? Do you want lots of space to express yourself? Or are you more concerned with fitting it on your desk, which is already full of pencils and paper? Weight: How heavy is it? If you’re just going to be leaving it in one place, this doesn’t matter much. But, if you’re toting it between places or want to travel with it, consider how you’ll feel carrying it. Screen Protector: A screen protector is especially important in models on which you can see what you’re drawing as you draw, but on models where you just draw and it appears on your own computer, this is not as important. Pen: A pen is a very important part of the drawing experience. Is this pen battery powered? Does it need its own cable? Is there a place to rest it on the tablet? These are all important things to consider. USB Compatible: If you want your doodles to make it into your digital world, USB compatibility is very important. Choosing a device that has USB capability can free you up to design how you want to. So let’s get down to business and get drawing. Skim through our top and budget picks if you’re short on time. They’re the best of the best and the best of the budget. If you really want to do your research read all the way to the end. Now that you know what to look for, you’re all set to find yourself the absolute best drawing tablet for your needs. 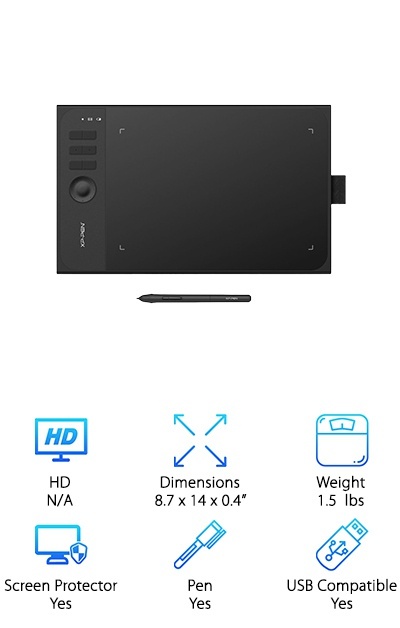 This is definitely among the best drawing tablets for artists, and is our top pick! This is a great pick for anyone looking for something that comes with all the features you need to create amazing drawings and animations. It has an IPS panel that allows you to easily switch between viewing positions without losing any of the clarity. 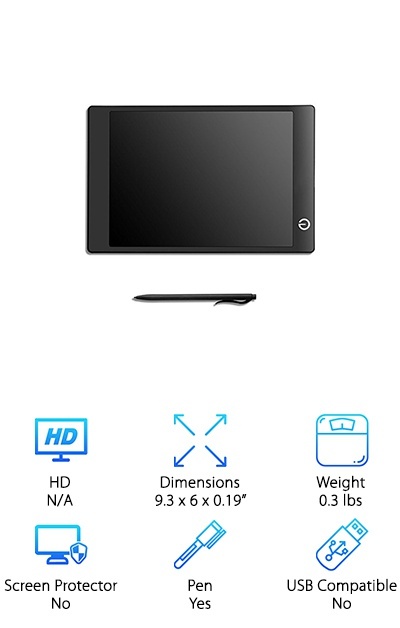 It is a widescreen LCD, which makes it a great choice for anyone looking for a large drawing table. It features GT-191 graphics and a 72% NTSC color gamut. This means that no matter what you want to draw, this tablet will be able to show you incredible color. IT can present 16.7 million different colors vividly, which makes it a great choice for artists who love color. In the box, there’s a brand new digital pen that comes complete with eight different pen tips, a pen holder, a charging cable for the pen and the table, an HDMI cable, an AC cable, and a power adaptor. If you’re looking for the best cheap drawing tablet, our budget pick may be for you. 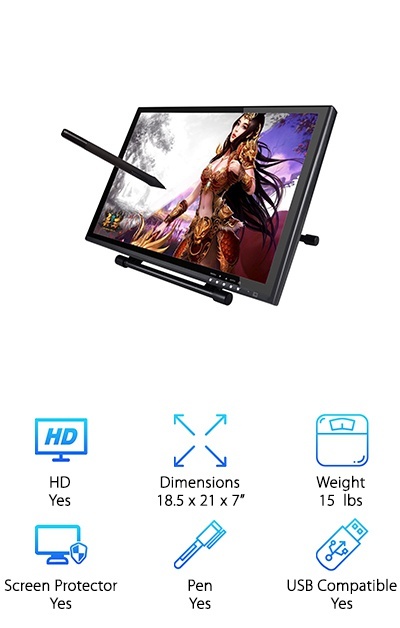 This tablet does not come with an HD screen but is a great choice for anyone who wants a simple tablet just to draw on. It does a great job for anyone looking for a simple tablet that gets the job done with your existing computer and graphics software. It has a big drawing area for big projects. It comes with a smart digital pen, which looks and feels like a real pen writing on paper. There is a button on the pen that can convert its function between a pen and an eraser, so it’s easy to clean up your mistakes accurately. The customized graphics tablet has 8 programmable buttons along the side of the tablet. They can be customized for whichever buttons you use most. This tablet will work with all the major graphics software, making it a great choice for anyone. This is an awesome drawing tablet for anyone looking for a giant drawing tablet. It comes with a roller key, as well as six shortcut keys. The shortcut keys are great for anyone looking for a quick way to use their favorite functions from their drawing tab. This tablet also comes with a stylus that does not require charging, which is a great plus for anyone who doesn’t want to carry around an extra charger. It comes with a 1050mAh lithium battery that charges quickly, so you won’t have to keep it plugged in all the time. It charges fully in around 2 hours and, according to XP-PEN will last for about 16 hours on a full charge. It responds to 8192 levels of pen pressure, which makes it especially good for people who want to draw on their tablet just as they would on paper. IT is USB compatible and comes with a flash drive, cable, and wireless receiver. This is a great choice for anyone looking for the best drawing tablet with screen. This tablet comes with a giant screen and a pen for drawing. You can connect it to a laptop or PC with a USB cable. This tablet comes with two drawing pens, as well as 10 pen nibs. This comes with a USB cable and a VGA cable. It also comes with a pen holder and two pen charging lines, just in case one gets lost. It also comes with a drawing glove, so your hand doesn't accidentally slip onto the screen and ruin your amazing drawing. This tablet is compatible with both Windows and Mac OS systems. 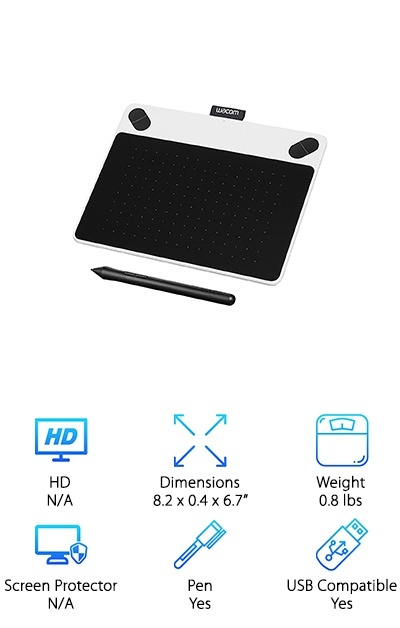 This tablet also comes with a stand that can prop it up in many positions, so you can draw in many different positions without being uncomfortable. The screen is very large and is a great choice for anyone who does large-scale drawings. This tablet also comes with a one year warranty. 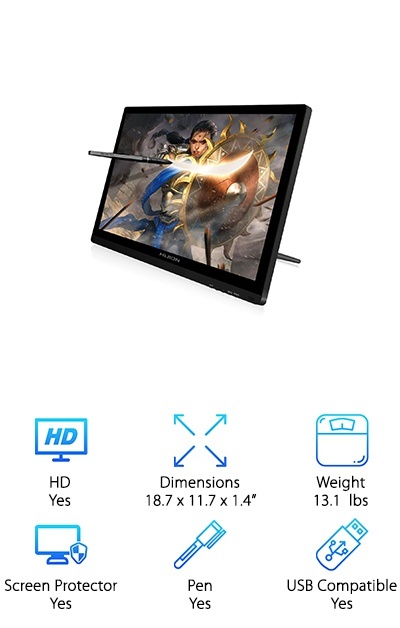 This is an awesome drawing tablet for computer, as it is compatible with both Mac and Windows OS systems. This is a great small tablet for beginners. It is lightweight and easy to situate on any table or desk. This tablet includes a battery-free pen so you can take your drawing to new heights, no need for extra chargers or batteries. This tablet even comes with its own drawing software- ArtRage Lite. It’s a great choice for beginners because it comes with everything you need to get drawing as soon as you take it out of the box. This software also includes online tutorials to help you improve your drawing skills and learn how to use your tablet effectively. It has two shortcut keys which allow you to easily use your favorite commands easily. The pen and tablet are both pressure sensitive which allows you to create variations in line width and opacity. They also allow you to use unique brush effects. 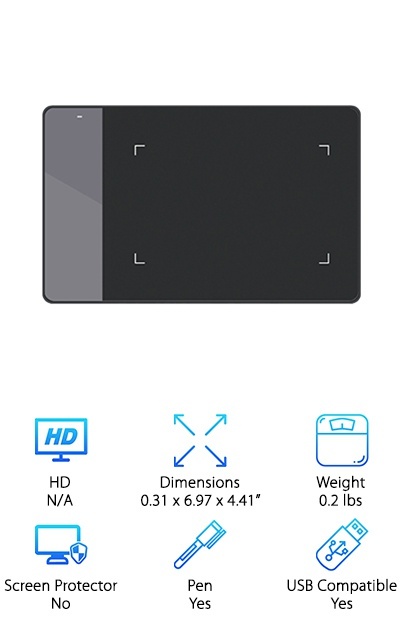 This is a great choice for anyone looking for a great, slim drawing tablet. This tablet is made by XP-PEN, which is one of the best drawing tablet brands. It has both wired USB and wireless capability. You can either plug the USB receiver that is included with the tablet into your computer or use a typical USB wire. This allows you to have flexibility with when are where you use your tablet. The lithium battery allows you to really take your show on the road. The stylus is battery free and has 2048 different pressure levels. Because it doesn’t require charging, this really is a great pick for anyone looking to move around with their drawing tablet. The different pressure levels allow you to truly capture what you want to draw. This also comes with six touch-sensitive shortcut keys on the side for any of your favorite commonly used functions. The size of this tablet makes it a great surface for any drawing. This is a great choice for anyone looking for a budget drawing tablet. It is made by one of the drawing tablet brands that appears multiple times on our list, so you know they’re great! 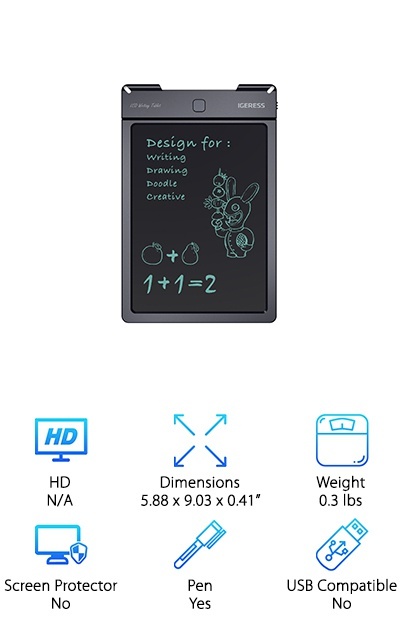 This is a great small tablet for anyone who is just getting started with drawing tablets. It can also be used as a mouse alternative for gaming or signing documents, in addition to a great drawing tablet. This tablet is very small and can easily fit in the case with your laptop, so you won’t need any extra cases. You also won’t need to add any extra bulk to your laptop bag or backpack. This tablet comes with a pen pressure rate of 2048. The digital pen has two customizable buttons, which can be programmed to do any action you like. The pen takes AAA batteries, so you won’t have to worry about constantly recharging it. It can be used for people who are both right and left-handed. 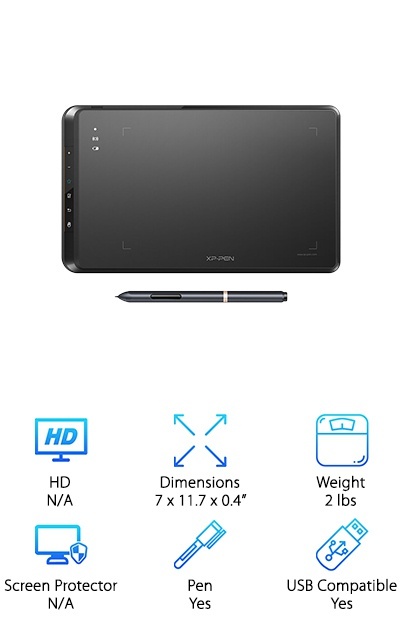 This is a great choice for anyone looking for a heavy hitting drawing tablet. 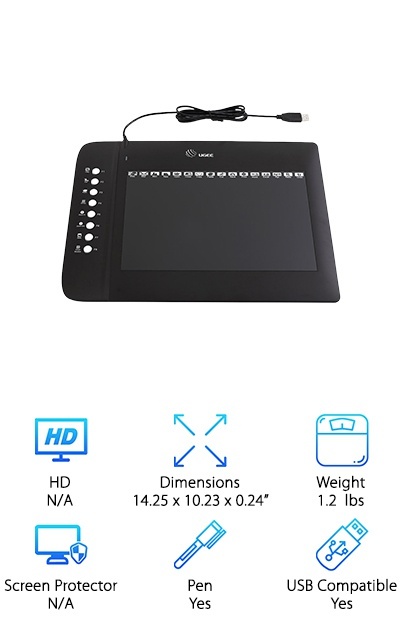 This may be the best tablet for animation drawing. It comes with two rechargeable pens, so you’ll never find yourself stuck without one. This interactive display can be hooked up to a desktop computer or laptop with the included VGA or USB cable. It comes with its own driver CD, which is easy to install. This tablet's response time is 5 ms. It has a pixel pitch of 0.294mm (per one triad) x 0.294mm (V). The resolution on this tablet is 1440 x 900. It has a pressure sensitivity of 2048 levels, allowing you to easily get the result you want. The pen is slim and lightweight. It has a rechargeable lithium-ion battery, which can support up to 800 hours of continuous use, according to Ugee. It even comes with an extra pen nib in case you lose yours. This is a great drawing tablet for people who just want to be able to leave notes around the house without using a crazy amount of paper. The fun, multicolored background is a great way to make your notes fun and light. IT feels just like writing on paper, so it’s easy to leave fun sketches with your notes. There is one button at the top that clears the screen swiftly. It’s very thin and light and easily fits in your bag or purse, so you can take it with you no matter where you go. The manufacturers have guaranteed this really cool board with a one year warranty. They have also thrown in a replaceable battery, and an extra, so you won’t have to worry about what happens if the battery dies. This is a great drawing board to keep kids occupied on long car rides, in restaurants, or anywhere else they need to be occupied without a lot of toys. This is a fun LCD writing tablet, which is a great choice for anyone looking for a quick way to jot down some notes without killing all those trees. The background is a nice and subtle blue/white color, which is a great choice for more professional uses of the tablet. This is a great thing to leave on your desk instead of post-its, which can get lost and are wasteful. Let your friends and coworkers leave you quick notes easily and intuitively. It feels just like writing on paper. This tablet comes with a pen that can be used to write on the tablet. The button at the top clears the tablet’s drawings easily and, according to IGERESS, can be cleared 50000 times, which is more than enough for most users. If you ever do run out, there’s a replaceable battery included so that you won’t ever have to worry. This is a great, fun tablet for work or home.